Weather patterns in the next six to eight weeks are likely to determine sugar prices for 2013. A general softening of world market prices continues as a result of improved weather conditions in the slow starting harvesting in the southern hemisphere regions, resulting in what will be a sizeable sugar surplus in quarter four. Weather related risks may still affect the global supply with mill maintenance work in Brazil being carried out in the second half of September due to wetter conditions. In the northern hemisphere regions of India and Thailand the amount of rainfall at the end of the monsoon season will be critical to the sugar supply. The current predicted global sugar surplus for the 2012/13 crop is estimated at 4.4 million tonnes following three years of stock drawdown. The Australian and Brazilian harvests are generally progressing well; North America volumes look good with Eastern Europe and the European Union predicting an average beet crop. 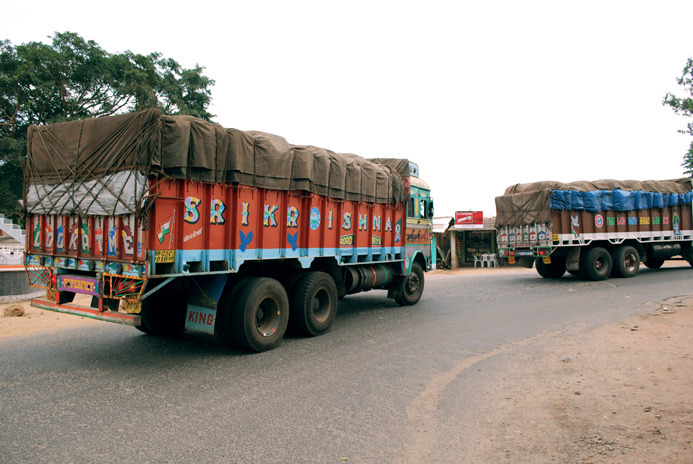 Lorries carrying sugarcane in India. As reported last month estimates for the 2012/13 beet crop is the production of 17.3 million tonnes of sugar, down from last’s year record crop of 18.5 mln tonnes. The campaign to process beet sugar has begun right across Europe. The beet crop has been affected by the cool and wet spring, although yields will be in line with the five year average. 2012/13 estimates for imported sugar is around 2 million tonnes. Russian and the Ukraine beet campaigns are well under way, but it remains to be seen how the summer droughts have affected the quality of the beets. The next two months will be critical to determining the outcome of the Brazilian crop. The weather has played a major factor in the harvesting of the 2012/13 crop, with the delayed start in April, followed by rains in June and late September. Dry weather is forecast for the tail end of the harvest which will be needed if production is to rise above 31.2 million tonnes. The export of sugar is the preferred option for the mills due to depressed domestic sugar and ethanol prices. Brazil is the world’s largest producer of sugarcane, of which half goes towards the production of ethanol. The lack of rainfall since the beginning of the year is likely to impact on the cane volumes for the 2012/13 season. Estimates for the cane crop has reduced by 3 mln tonnes to 99.6 mln tonnes of cane. Although this is an increase over last year’s 98 mln tonnes, the recovery of sugar will be reduced and is unlikely to match the 10.2 mln tonnes of sugar produced from the 2011/12 campaign. Harvesting is due to commence in November, with exports likely to be less than 7 mln tonnes exported in 2012. Since July domestic sugar prices have risen by 20% and in the state of Maharashtra there has been a reduction in cane supplies, so the mills will be keen to start crushing the 2012/13 cane crop as early as possible. Early crushing will lead to lower sugar recovery and yields with the canes already affected by the lack of rains during the monsoon season. As with the Brazilian crop, the weather will determine the Indian harvest. Rainfall at the end of the year will reduce harvest yields, but improve the development of the 2013/14 crop; low rainfall will improve harvest yields but will be negative to the development of the 2013/14 crop. The risk to long term supply may result in India importing sugar as the country struggles with rising food prices. Despite the Queensland rain showers in June/July, slowing the start to harvesting, dry weather followed for the following period contributing to an estimate of 4.5 mln tonnes production target for the 2012/13 campaign, with exports of 3.5 mln tonnes achievable. Cane crushing should be complete by mid-December. The 2013/14 crop will need extra irrigation and fertilisers as a result of the recent arid conditions. With early plantings of sugar beet this year in the US, harvesting is well ahead of previous years, with the beets in excellent condition with estimates at 4.33 mln tonnes sugar from beet. Hurricane Isaac hit the Louisiana cane region, but with minimal damaged to the cane crop. In Mexico a wetter summer will produce higher cane yields and despite a reduction in planted area estimates for the 2012/13 crop is for the production of 5.3 mln tonnes of sugar. Despite the recent record in domestic sugar production, China became the largest sugar importer in 2012. The last few years has seen an increased usage in corn sweeteners at the expense of sugar. With the current high corn sweetener values as a result of record corn prices, we expect to see a switch back to sugar usage now that world sugar prices have softened.